Sump pumps efficiently remove accumulated water from basements, but then the water has to go somewhere. The simplest installations have a discharge hose leading from the house to the outdoors. Hoses that sit on top of the ground work, but they are unsightly and must be moved for mowing and yard care chores. Burying the pipe or hose eliminates that problem; however, the buried hose must connect to a disposal point. Burying a sump pump line is not that difficult once you've established a plan for where you want the line to go. Plan the location of the buried sump pump line. The discharge end can be in a low spot in the yard with natural drainage. However, the water from the sump pump line should not cross property lines without the permission of a neighbor. A better disposal location is directly into the city storm water system or, if one is present in the community, a sump pump collection system. The input end of the buried pipe is commonly located just outside the house wall above the position of the sump pump in the house. Check with your local utilities to see if there are any buried cables or pipes within the planned project area. Also check for cables or pipes you or previous homeowners may have buried, such as power cables for light posts and water lines for watering systems. Check the height of the storm sewer or sump pump collection system with your local public works department. This height becomes the lowest point of the buried sump pump line, as the pipe will slope toward the connection with the municipal system. Dig a trench along the line you planned in Step 1. Slope the trench with a rise of 1 inch for every 8 feet as it moves from the discharge point to the house. Place a 4-inch PVC pipe in the trench. Test-fit the pipe before gluing it together with PVC glue. 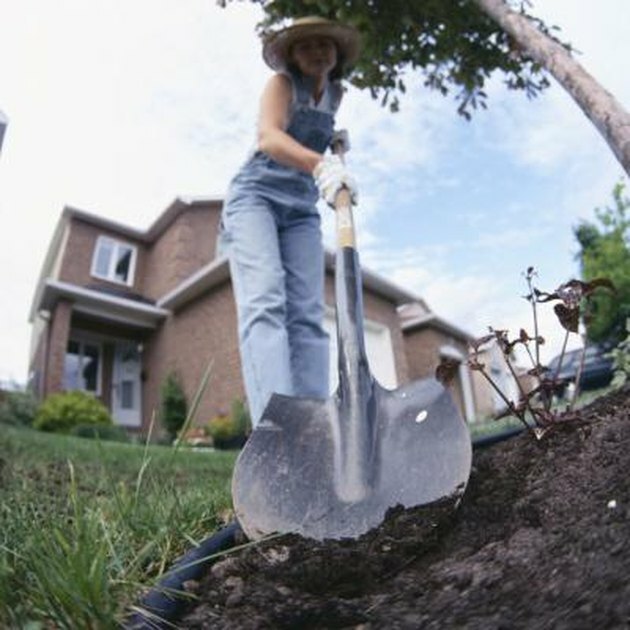 Connect the pipe to the sump pump by attaching an elbow at the input end of the buried pipe. Connect a piece of pipe long enough to reach to the sill of the house to this elbow. Mount another elbow and a short length of pipe that penetrates through the home at the sill. Connect the pipes of the sump pump system to the pipe in the basement of the home. Backfill the trench with the soil you removed during the excavation process. Tamp the soil to normal compaction and replace the sod over the area.